If the flash demo of D3publisher's upcoming space-age Puzzle Quest follow-up wasn't enough for you, head over to Big Download for the full 128mb PC demo of Puzzle Quest: Galactrix. 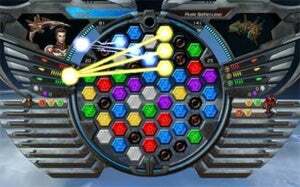 Rather than just place you in the middle of the same fight over and over again, the PC demo for Puzzle Quest: Galactrix contains the game's single-player story and instant action modes. I story mode you can create a character and take them to level five, but you can't save your hero and are limited in the number of star systems you can visit. Still, there are star systems to visit! Take that, flash demo!